I picked this one up last week. Man, I just need to stay out of the midtown tourist traps. 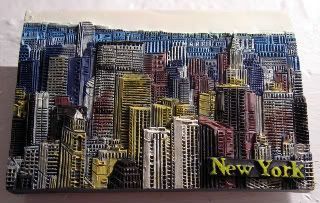 The newer gift shops have these magnet walls at the back with dozens and dozens of NYC magnets. I mean, I live here, what the heck do I need with more New York magnets? But dudes! They're so pretty! Look! I particularly love this one for the design. Think about it: For every building, there's a company or organization or family inside. For every little window in every building, there's a person, place or thing behind it. A million, trillion stories, here on this tiny island only 23 square miles big. I can't even imagine what Dutchman Peter Minuit would say if he ever saw modern-day New York. He landed on the island today back in 1626, and it was pretty much all wooded area. Minuit was the guy who is credited with purchasing the land from the native Algonquins for the equivalent of $24. Whoa, hello blue light special.